This "Kitchen Sink" kale salad has become a go-to weeknight meal when we're looking for a filling and satisfying vegetable binge. It has been deemed the "kitchen sink" salad because we tend to throw whatever we have on hand into the salad base mixture. This is our standard summer salad because we tend to have these ingredients on hand, but you can substitute any sort of fruit (fresh or dried) and vegetable into the mix. The dressing provides a slightly sweet base that is a great backdrop to any fruit or vegetable. It is great day the day of, and makes a great leftover lunch salad. 2 small. Cut into 1/2 inch dice. 1 medium. Any apple will work in this recipe, but we used a honeycrisp because it's what we had on hand and it adds a sweet pop of flavor. Small dice for even distribution in the salad. About half a cucumber. Cut into 1/4 inch slices and quarter. De-stem and rinse the kale in a salad spinner. Once the kale has been rinsed and dried, cut in to tiny slivers and place into the serving bowl. Sprinkle the kale with coarse sea salt and massage the salad for 1-2 minutes to begin the softening process. Prepare the dressing in the salad dressing shaker and pour into the bowl with the kale. Massage for another minute or so to get the dressing onto all of the kale. Let the salad sit for at least an hour. While the salad is resting, preheat your oven to 425 degrees F. Toss the beets and sweet potato in olive oil, sprinkle with chipotle powder, and liberally salt and pepper. Roast for 20-25 minutes, turning 2-3 times while cooking. The beets and sweet potato are finished roasting when they can be pierced with a fork with minimal resistance. While the beets and potatoes are roasting, chop all of the ingredients but the apple and the onion and add them to the salad. Once the beets and sweet potato are done roasting, let them cool to warm or room temperature before adding to the salad base. 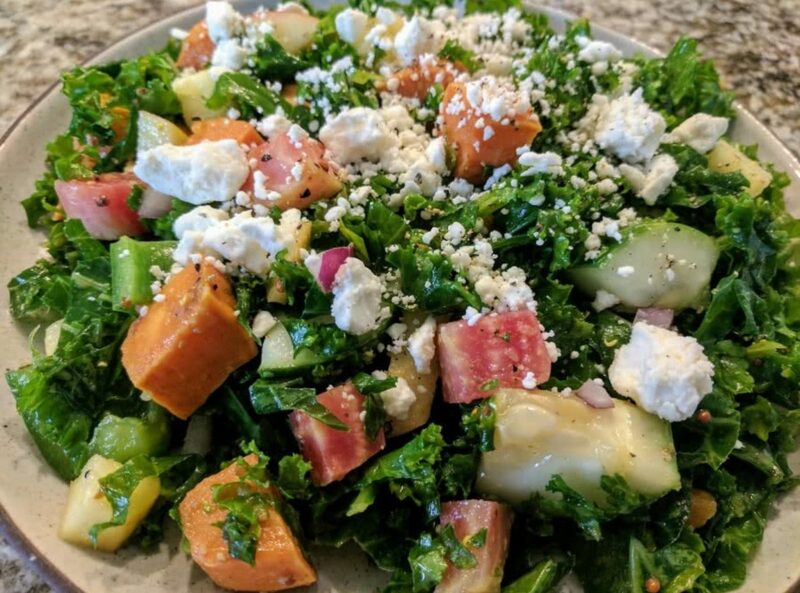 Once the beets and sweet potatoes are cooled, add them to the salad base along with the apple and onion, toss to combine all ingredients, and add freshly ground black pepper to taste to the entire salad base. Plate the salad individually and top with a generous sprinkling of feta cheese and enjoy!